Waiting was on Kevin Henkes's mind even before he won a 2016 Caldecott Honor and Geisel Honor for his picture book Waiting--and certainly after that. Thinking about waiting led to his contemplation of the nature of an egg... its secretive, transformative and even suspenseful aspects. In his picture book Egg, preschoolers will wonder when, when, will the last pastel-colored egg hatch? That pale green one sure is taking its sweet time. The reader will just have to wait. 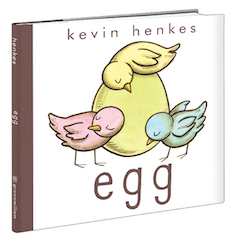 Henkes had fun with Egg, a book he says is "not a traditional story" but is "a graphic novel for preschoolers," due to its simple grid structure that works as basic story panels. The opening page reveals four eggs in four quadrants: pink, yellow, blue and green, all in the same brown ink and watercolor medium Henkes chose for Waiting. Each egg is simply labeled "egg." The facing page is a quadrant, too, and now the pink, yellow and blue eggs are cracking. Each of the three cracked eggs is labeled "crack." But not the green one--it's still labeled "egg." 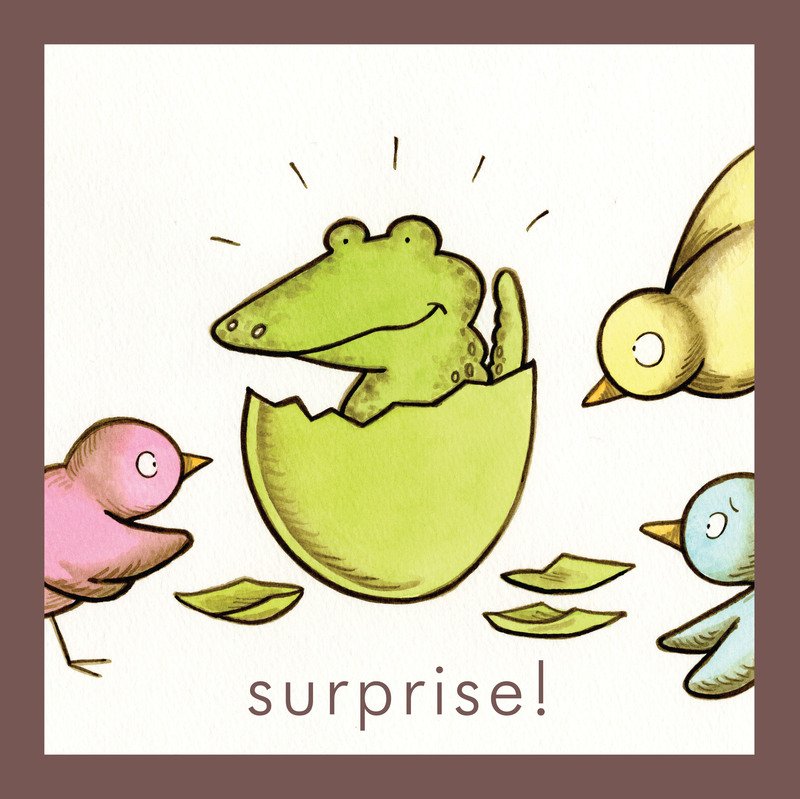 On the next spread, the pink, yellow and blue eggs in their quadrants hatch into pink, yellow and blue birds ("surprise! surprise! surprise!"). But not the green one: "egg." 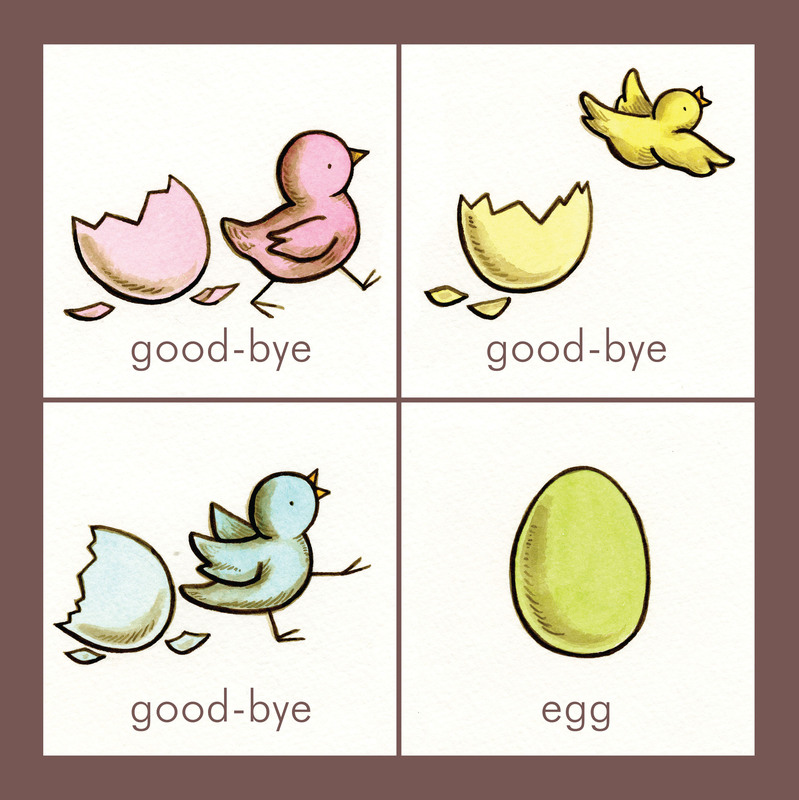 Then, the birds fly off ("good-bye/ good-bye/ good-bye/ egg"). At the turn of a page, the green egg now stands alone, larger than life, paired only with the word "waiting." The facing page splits into a 16-square grid with 16 green eggs inside... and 16 labels... "waiting." This is a lot of waiting. Henkes says, "I was intrigued with the question, What happens when you use the same picture but change the word underneath it? And how does that change how you feel about the picture? As you look at the picture of the green egg paired with the word egg, and then at the picture of the green egg with the word waiting, there's a subtle difference in how the reader or listener interprets that image. And then if you take the image of the egg and draw it 16 times, it again changes the meaning." One by one, the sweet little birds return to check on the progress of the unhatched green egg. They listen, eyes closed, for anything stirring inside, then they start to peck at the shell. One full page and four more quadrants show the birds pecking at the egg, eyes now shut tightly with the effort of it. Then there are 16 quadrants with nothing but "peck-peck-peck" written inside each square. (Says Henkes: "Where it says peck-peck-peck 16 times, I imagined a child poking the paper with his or her finger.") Then, "crack!" Then, "surprise!" The birds' eyes grow wide. It is a baby alligator! With the birds' distress registering only as a worried eyebrow, they fly off. In four more quadrants, the alligator is "alone, sad, lonely, miserable," in a gloomy (but also rather amusing) progression. The birds return. 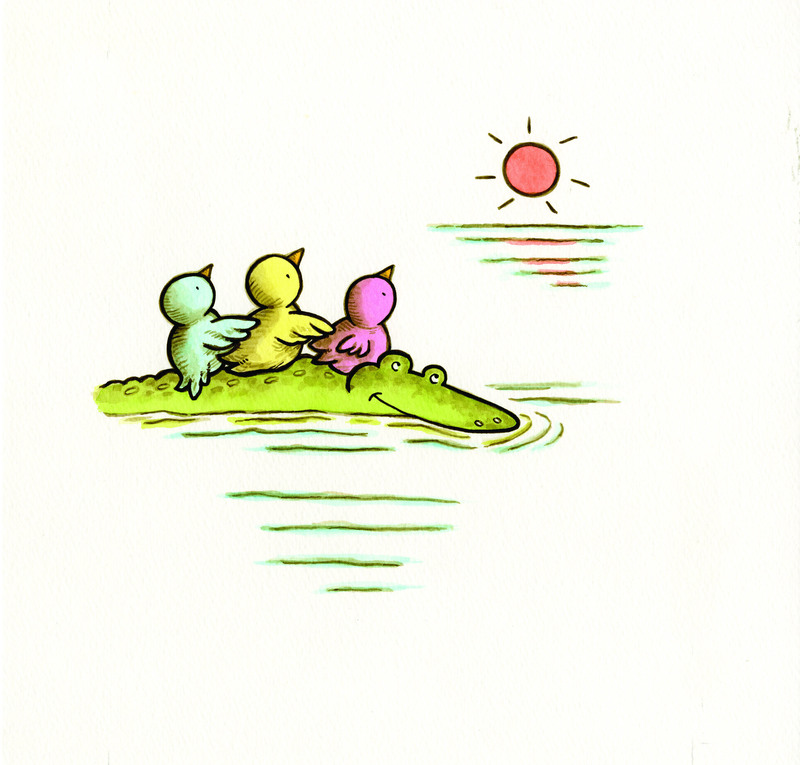 They befriend the once-lonely alligator, sit on his bumpy, floating back and watch the orange sun set, but not before the sun turns into an orange egg. This surrealistic twist transforms the reading of Egg. Henkes eloquently explains this shift: "This is an altered reality where something big can come from something small, a world that's both real and unreal. Surreal in a gentle kind of way." "The end..." says the text beneath the big orange egg. But turn the page and it says "maybe," and an orange bird flies off the white page. Every design detail in Egg is carefully considered. The lowercase title, "egg," is hand-lettered so that each letter is egg-shaped. The eagle-eyed will notice that each bird has different characteristics--for example, the pink bird likes to point at things. The final solid page is the same coral-orange color as the setting sun egg. The endpapers are a grid pattern, reflecting the four colors of the original eggs. ("It just came together in a moment where everything just seemed right, just BOOM," says Henkes.) Underneath the jacket, on the case, sits the word "egg" on a blue background, and five eggs in a row across the bottom. Kevin Henkes pitched his first picture book to Susan Hirschman of Greenwillow Books at age 19 and was off to the races. He received the 2005 Caldecott Medal for Kitten's First Full Moon, Caldecott Honors for Owen and Waiting, Newbery Honors for his novels Olive's Ocean and The Year of Billy Miller, and Geisel Honors for Penny and Her Marble and for Waiting. 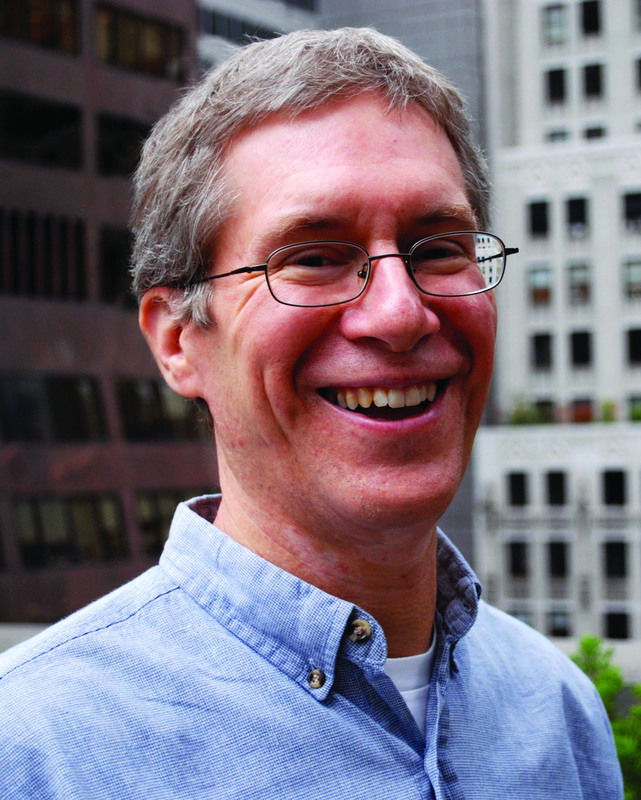 Henkes lives in Madison, Wis., with his wife and fellow illustrator, Laura Dronzek, and has two college-aged children. Shelf Awareness talked with him on the phone, mostly about his picture book called Egg (Greenwillow, January 3, 2017). Egg is your 50th published children's book. Can you get your head around that? No, I cannot! But I have a list on my bulletin board of every book that I've done. After I finish a book I type the title on my typewriter... and I've had that same piece of paper since 1981, and there they all are. So I know that it's true, but it is hard to believe. It's kind of fun, and it's great to have easy access to all of them in order. I looked at the list recently, and there are only two years since 1981 that I didn't publish a book. Do you ever just line up all your books end to end on your studio floor and walk among them? I have not. For one thing, I'd have to vacuum. When we talked last year about your now-award-winning picture book Waiting, you said, "Waiting is definitely on my mind.... There's another picture book I'm illustrating called Egg and there is a lot of waiting in that, it's mentioned maybe 17 times." Tell us about all this waiting. Well, I have been thinking about waiting. And that led me to think about eggs. In my studio I collect things that I like on a shelf. Not long ago, three little things caught my attention. One of the things is a china egg that Susan [Hirschman] gave me many years ago. I also saved a plastic egg--a little baby buggy--that was my daughter Clara's. I kept it because it seemed to scream, "There's a story here somewhere!" I also have a little egg that's an eraser that I bought when I needed to draw erasers for one of the Billy Miller illustrations. I think eggs are interesting because when I look at an egg I think of transformation--and expectation--and with this book I was thinking of misconceptions. Eggs are also about concealment and containment. And the story just hatched one day? I think the main force behind Egg is that I've been intrigued by wordless books for my whole career, but I'm so in love with type that I've never really wanted to make one. But when I decided, again, that I might like to try it, I couldn't! So I asked myself, "Can I tell a story by using single words only, no traditional sentences?" That's how it really began. Tell us how you decided to format Egg in panels. Is this a "preschooler's first graphic novel?" How did you use boxes and grids in your storytelling? As I was working on it, I did think of it as a graphic novel for preschoolers. I really do love visual storytelling with no words. Several of my books have that in them. In A Weekend with Wendell, Wendell and Sophie are playing with the hose and they become friends and a rainbow forms... a lot of that is told just in the pictures. And in Julius, the Baby of the World, when Lilly's in the uncooperative chair, it wordlessly shows the passage of time. And you are also playing around with comic timing, right? Yes. Absolutely. 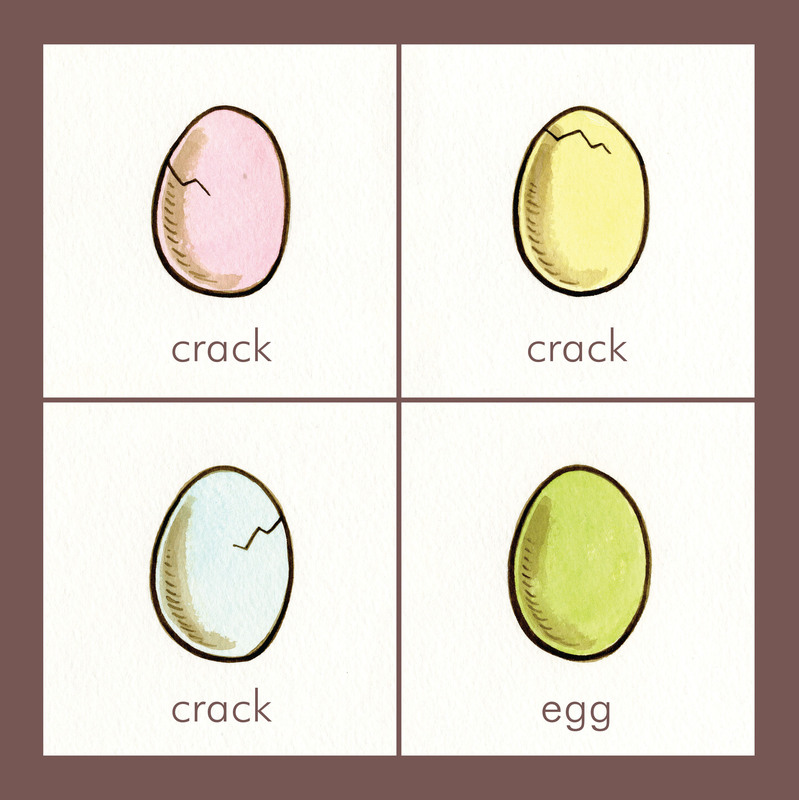 In the opening series of Egg, the green egg is down in the lower-right quadrant, and just labeled "egg," [while the other egg images later say "crack" and "surprise!"] because it's not hatching like all the others. I think of that as being wildly funny. It is funny. I like that you say "wildly funny." I did think of it as wildly funny! Who knows? Maybe, maybe not. Did you think it was wildly funny? Maybe I'd say "pretty funny." Kevin Henkes-funny, right? I did. I read a lot, and they were part of what I read. I didn't by any means only read comics. I preferred picture books and novels, and I loved novels the most. Back to Egg. Which came first, the chicken... or the alligator? I didn't have the reptilian figure in the beginning at all. I knew one egg would be late to hatch, but I didn't know what it would be. I even toyed with the idea of it being a chocolate egg. I thought of lots of different things and all of a sudden it came to me, in the way that things do. And then, when the baby alligator scares off the birds, it became a study in cross-species tolerance? Ha! I was thinking of Egg as a gently surreal little movie-musical. I imagined different music for the pink, yellow and blue birds. The pink bird, even on the page where it says "good-bye," seems to be walking with purpose. And it points several times. It's bossy. The yellow one on the first page is flying when the other two are walking, and coming from far away, so I think of the yellow one as being more adventurous. The sun turning into an egg at the end could be open-ended and a little surreal, but it fit perfectly into the idea of what I said before about eggs and transformation and expectation... a nice little ending for that movie-musical. I am clearly going to have to read Egg again with all this in mind. I didn't want it to be overwhelmed with "extras," but I wanted something there to give it texture. Especially for the adults who are going to be reading it 150 times to their children. Yes, I imagined this book as interactive, something one might share with a child on one's lap. You keep trying out new styles. Is there one style you consider your "main style" and another that you consider "branching out"? Or is it all equally "you"? I think it's all equally me. People have said that some of my books are bolder and the line is thicker compared to the mouse books like Lilly's Purple Plastic Purse. I might be using a brush rather than a crow-quill pen but I tend to make my marks the way I make my marks. Every now and again I'll do something very, very different, but I tend to go back to the way I always do things. So, maybe not Kandinsky next? Probably not, but you never know. It's fun to limit myself. With Egg, I decided early on that I would not have backgrounds at all. And I limited myself to four colors... I guess five. I really like limiting myself. It opens up a world of possibilities, which seems ironic but true, too. Yes. To limit yourself in how you use words--and how many words--and still come up with something that makes sense. I remember you saying that novels seem easy when you're working on a picture book and picture books seem easy when you're working on a novel. That's so funny because throughout most of A Parade of Elephants I was thinking, "I just want to do a novel, I just want to do a novel." Yes! It's a very young picture book. There are sentences this time, though. It's about five elephants and what happens to them on a typical day, but it's very, very simple. I've wanted to do an elephant book for years and years and years. And this I think came about because of the little elephant in Waiting. You need a new one since you killed off that elephant. How is it that you know so well how to tell stories to young people? When I'm working on a book I don't particularly think about a child reading it. I become lost to whatever it is I'm working on. I want to make a book that is rich and thickly textured and deeply felt, but I do want it to be for a child and I don't want it to be overly ironic. It seems like a lot of children's books are ironic, but it isn't what I'm drawn to. My niece has two young kids. They don't seem to be ironic at all. Their sense of imagination is incredible to watch, and they are so full of joy, and they are so good at pretending. They marvel at a leaf or a rock and start making up stories for things like a leaf or a rock. Watching them confirmed for me what I think I've known from watching my own kids. It confirms what makes me feel good about how I approach books, and it explains the kinds of books that I do.